All prices are correct at time of going to press. Prices may change without prior notice and may not be altered on the website immediately. VAT is 20% and prices will rise if VAT increases. Prices stated are for maximum occupancy, i.e. 2 adults in a double or twin room. A single supplement is payable if this is not achieved. 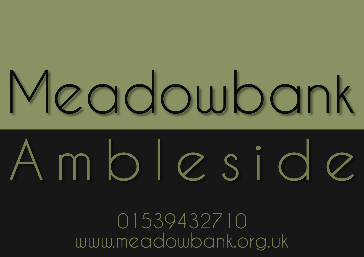 Children are welcome at Meadowbank. Under 5’s £10 per night (we do not provide cot or bedding). 5 to 14 half the adult price when sharing with 2 adults. A non refundable deposit is required of the first nights stay per person when booking. We accept cash, cheque with a bank card, debit cards and most credit cards. A single supplement of £20 per night is due if a double or twin room is taken as a single for all or part of the stay.